This year, the United States Marine Corps celebrates the 100-year anniversary of female Marines who pioneered the path of women’s enlistment in the United States Marine Corps and 75 years since the arrival of the first woman based at Camp Pendleton. The first woman who enlisted in 1918 was Pvt. Opha May Johnson, two years before she would even be legally able to vote. Capt. Lillian Daly arrived at Camp Pendleton as the first female Marine in March 1943, and six months later an assemblage of 95 women Marines entered on active duty during World War II. The Women Reservists barracks had a fence with a posted Marine bodyguard to discourage the male Marines. Each female Marine was outfitted in “Montezuma Red” lipstick and nail polish developed by Elizabeth Arden to match the cord attached to their uniforms. Women have served in every war, taken the helm in uncharted commands and now proudly have removed the red cord on their uniforms which shows they now stand shoulder to shoulder with fellow male Marine Corp soldiers. 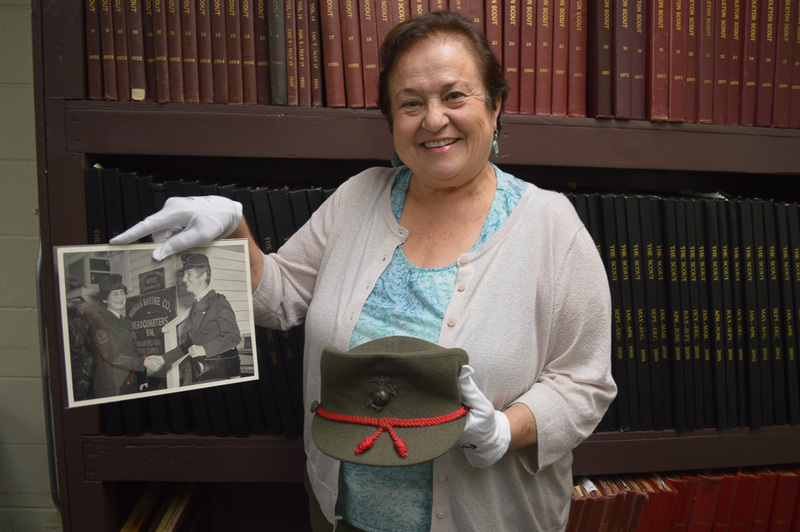 “Women Marines did much more than ‘Free a Man to Fight’ in World War II,” said Faye Jonason, director of the Camp Pendleton Museum. “While Women Reservists primarily performed clerical duties in offices, many served as photographers, aviation mechanics, truck drivers and conducted weapon inventory.” After World War II, Camp Pendleton became a demobilization center for Marines. The women’s commitment through the Korean and Vietnam Wars let Camp Pendleton become the first permanent barracks for female Marines in 1969. Women chipped away at gender barriers when Sgt. Maj. Eleanor Judge became Camp Pendleton’s first female sergeant major in 1980. It wasn’t until 2009 when Ret. Sgt. Maj. Ramona Cook would take her post. The Los Angeles native became a Marine in 1982 after studying behavioral science. The women’s Military Occupational Specialty training remained limited to the communications or radio repair sectors and fewer in the field, Cook recounts. The National Defense Authorization Act of 1993 repealed the limits of women in flying aircraft combat missions. Sgt. Maj. Valerie A. Camacho, of the Marine Light Attack Helicopter Squadron, needed her parents’ signature to enlist in the Marines at 17 years of age in July 1996. She also worked in the Marine Tactical Air Command Control Center as a drill instructor when she deployed for three years in Iraq. The Secretary of Defense lifted the ban on women in infantry in 2013 to be exclusively trained at Parris Island, South Carolina, School Of Infantry East. In March, Camp Pendleton’s School of Infantry West opened to women, according to Capt. Abigail Peterson of the West Office of Communication at Camp Pendleton. In 2016, U.S. Secretary of Defense Ash Carter removed the women’s cap on gender-based restrictions, and three months later the Marine Corps announced they would follow the same policies.